The Mass Spectra of Volatile Compounds in Food collection includes 1,620 reference mass spectra and covers the whole range of volatile compounds in food. Apart from the large number of natural, nature-identical, and artificial flavours and aromas, there are – among others – food additives and solvents, pesticides and veterinary pharmaceutical compounds, which are frequently found as residues. Derivatives of non-volatile compounds, such as sugars or polyhydroxyphenols, are also available. A substantial number of the flavour and aroma compounds in this collection contain oxygen functional groups. The following are frequently present: alcohols, ethers, aldehydes, ketones, acetals, ketals, acids and esters. 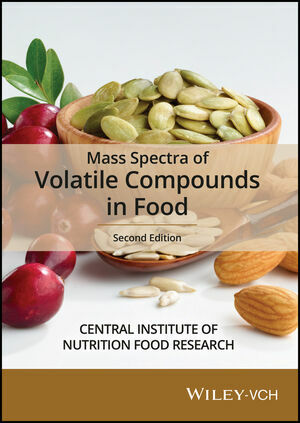 Central Institute of Nutrition and Food Research is the author of Mass Spectra of Volatiles in Food (SpecData), 2nd Edition, published by Wiley.